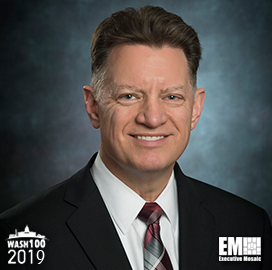 Executive Mosaic is honored to announce Rick Wagner, president of mission, cyber and intelligence solutions group at ManTech International, as an inductee into the 2019 Wash100 — Executive Mosaic’s annual selection of the most influential voices in the government contracting arena — for his leadership and efforts advancing the company in cyber, intelligence operations and mission IT. This marks the second consecutive Wash100 award for Wagner. Prior to joining ManTech in 2015, Wagner served as its executive vice president and chief operating officer. He also worked as the head of advanced technology solutions business for ManTech, leading its cyber, mission IT and intelligence operations. Throughout 2018, the Fairfax, Va.-based company continued its work with the U.S. government as it secured new contracts supporting various federal and military missions. For instance, ManTech received a potential 10-year, $158M contract in October to help the U.S. Air Force Space Command secure its mission-critical programs. Wagner said the contract helped the company build its strategic relationship with the command and advance programs supporting national security and ensure a U.S. military edge worldwide. Prior to the award, he also noted that ManTech will help accelerate the implementation of cyber capabilities across the federal government. The company received a potential $668M task order in the fall to support the Department of Homeland Security’s Continuous Diagnostics and Mitigation program. Under the contract, ManTech provides cybersecurity services to Group E federal agencies, including the departments of Education and Housing and Urban Development, the Environmental Protection Agency and the Small Business Administration. ManTech is also working on another 10-year, $959 million contract to assist an agency within Department of Defense manage its information technology systems across the globe. Before his time with ManTech, Wagner served as the chief strategy officer at TASC, where he led merger and acquisition activity. That included the integration of the merger between the company and Engility Holdings. Wagner has also held management positions with Raytheon and Lockheed Martin and worked as a software engineer and project manager for the Naval Surface Warfare Center. He earned a Bachelor of Science in electrical engineering from the University of Pittsburgh and a Master of Science degree in engineering management from George Washington University. Executive Mosaic congratulates Rick Wagner and ManTech’s Mission, Cyber & Intelligence team for their selection to receive the award. This year represents our sixth annual Wash100 award selection. The Wash100 is the premier group of private and public sector leaders selected by Executive Mosaic's organizational and editorial leadership as the most influential leaders in the GovCon sector. These leaders demonstrate skills in leadership, innovation, achievement and vision.